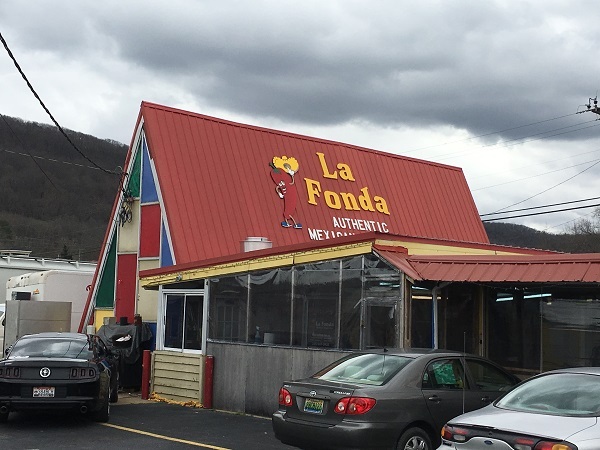 La Fonda, Fort Payne AL – Marie, Let's Eat! My mother has moved back to her hometown, giving us an excuse to come visit this authentic Mexican restaurant which occupies a delightful, and familiar, old A-frame building. A few weeks ago, Marie and I drove down I-59 to Alabama to pick up our son, who had been visiting his grandmother for a long weekend. As longtime readers may remember, Mom and her husband had moved to the suburbs of Orlando, allowing us to make a few trips to or through central Florida and sample lots of good eats down there. However, a combination of homesickness and some ailing relations in their families brought them back to the valley between Lookout and Sand Mountain, where they had actually first met in the late 1950s. Because I’m a cynical little mercenary, I figured this would give me just the reason I needed to finally check out a building in Fort Payne that I had read about some eighteen months ago. That it’s home to a quite good Mexican restaurant is almost beside the point! 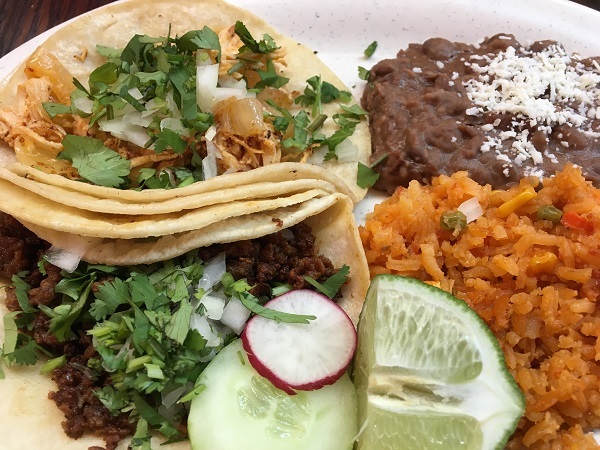 In deference to our good friend Helen, who hasn’t even once come to visit us since we moved to this godforsaken town (“Only Mama Knows” – P. McCartney, 2007), Marie ordered lengua tacos. I had my usual samplers of chicken and sausage. These were really good tacos! I was slightly less wild about the selection of sauces, but the meats were all very good and full of flavor. I especially enjoyed the chicken. The prices were quite reasonable – the three of us ate for around $20 – and it was a very filling lunch. I was interested to have read that Fort Payne has had a quite large Spanish-speaking population for the last couple of decades, and that gave rise to markets and restaurants that serve authentic Mexican and Central American cuisine, rather than the usual ground beef tacos in crispy shells that you normally see in Mexican restaurants in towns this size. After enjoying our food, I had hoped that we might learn a little more about the history of what I understood was an old and small chain called Jack’s Hamburgers, with stores in Etowah and Dekalb County AL. 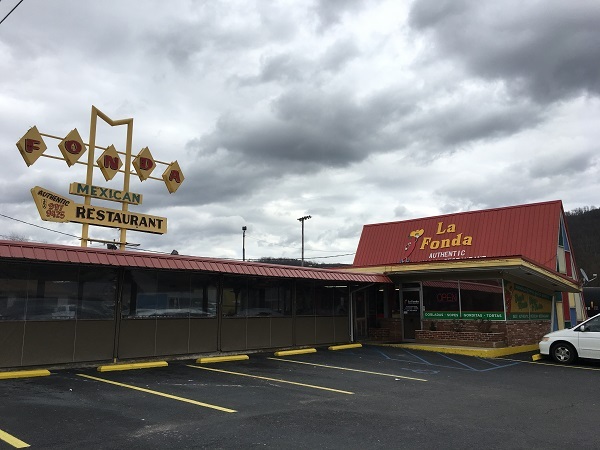 In 2014, the Southern Foodways Alliance confirmed, in this terrific story about La Fonda, that this was originally a Jack’s, and was owned by Jack Locklear. (This was totally unrelated and unaffiliated with the much larger chain, also called Jack’s, with stores throughout northern Alabama, southern Tennessee, and western Georgia.) Surprisingly, the gentleman with whom I spoke told me that their landlord believed that the Fort Payne Jack’s was the only one. In 2015, I had visited the Big Chief Drive-In in nearby Glencoe, which has exactly the same A-frame design. I had read that this had also been a Jack’s. In addition, there was a second-and-a-half, if you will, in Gadsden. Mr. and Mrs. D.E. Locklear owned the Pic-a-Burger, which had been a third building with the identical A-frame shape and colorful exterior walls. I don’t believe that this building is still standing. It was easy to see how we missed this building on the previous trips to the area; the A-frame itself is fairly well-hidden from the road by the expansion. 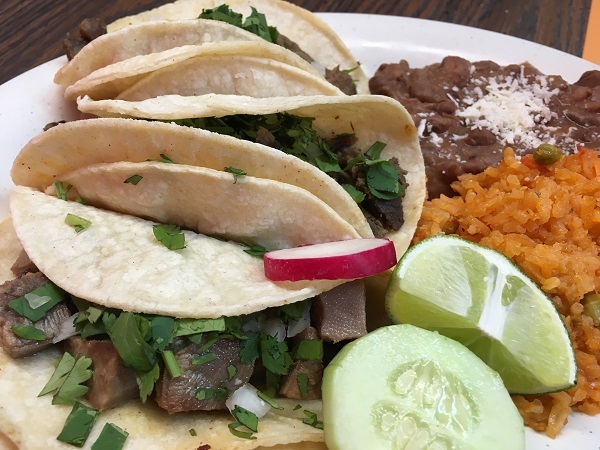 But whether you’re a design or history weirdo like me, or you just want some darn good tacos, La Fonda is a downright fine stop, miles better than the sort of El-This-Los-That place that you might expect to find in a smaller town like Fort Payne. Posted on March 13, 2017 by Grant G.Posted in alabama, mexicanTagged alabama, fort payne, mexican, mexican - traditional.